3D printing of live, human liver? Yup. Same for tissue with blood vessels, as well as kidney, muscle and breast cancer. It all holds promise for the future, and sure beats cranking out plastic guns for the betterment of humankind. 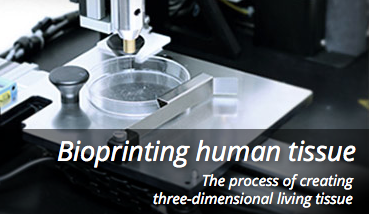 Basically, it’s done by pushing living cells through what amounts to inkjet printer nozzles. Here’s an excerpt from the news story I wrote for Pharmaceutical Commerce. Organovo (San Diego; www.organovo.com), is among the more ambitious firms, having bioprinted in the lab….Bioprinted liver tissue holds the most immediate promise; Organovo announced in late January that it had delivered its bioprinted liver tissue to an outside laboratory for experimentation. The biopprinted liver strips, roughly 20 cells thick, could provide a reliable (and profitable) supply for use in drug toxicity testing. This entry was posted in Healthcare, How stuff's made. Bookmark the permalink.